For the medieval count, see Ptolemy I of Tusculum. Ptolemy I Soter (/ˈtɒləmi/; Greek: Πτολεμαῖος Σωτήρ, Ptolemaĩos Sōtḗr "Ptolemy the Savior"; c. 367 BC – January 282 BC) was a companion and historian of Alexander the Great of the Kingdom of Macedon in northern Greece who became ruler of Egypt, part of Alexander's former empire. Ptolemy was pharaoh of Ptolemaic Egypt from 305/304 to 282 BC. He was the founder of the Ptolemaic dynasty which ruled Egypt until the death of Cleopatra in 30 BC, turning the country into a Hellenistic kingdom and Alexandria into a center of Greek culture. Ptolemy I was the son of Arsinoe of Macedon by either her husband Lagus or Philip II of Macedon, the father of Alexander. Ptolemy was one of Alexander's most trusted companions and military officers. He had been an intimate friend of Alexander since childhood. After the death of Alexander in 323 BC, Ptolemy retrieved his body as it was en route to be buried in Macedon, placing it in Memphis instead, where it was later moved to Alexandria in a new tomb. Afterwards he joined a coalition against Perdiccas, the royal regent over Philip III of Macedon. The latter invaded Egypt but was assassinated by his own officers in 320 BC, allowing Ptolemy I to consolidate his control over the country. A Macedonian, Ptolemy was born in 367 BC. Like all Macedonian nobles, he claimed descent from Heracles, the mythological Greek founder of the Argead dynasty that ruled Macedon in northern Greece. 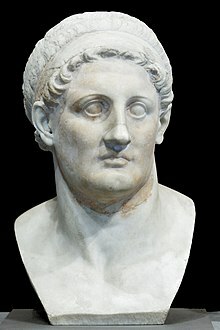 Ptolemy's mother was Arsinoe of Macedon, and, while his father is unknown, ancient sources variously describe him either as the son of Lagus, a Macedonian nobleman, or as an illegitimate son of Philip II of Macedon (though this claim may have just been made to legitimize his right to rule by claiming to be of royal blood). The paternity of the latter, if true, would have made Ptolemy the half-brother of Alexander. It is possible that this is a later myth fabricated to glorify the Ptolemaic dynasty. However, the genealogical strands preserved in a number of accounts state Ptolemy is presented as having direct blood relationships with the Argead kings. Satyrus the Peripatetic traced the patrilineal descent of Arsinoe directly through Macedonian kings, back to Heracles. Ptolemy served with Alexander from his first campaigns, and was among the seven somatophylakes (bodyguards) of Alexander. He played a principal part in the later campaigns in Afghanistan and India. He participated in the Battle of Issus, commanding troops on the left wing under the authority of Parmenion. Later he accompanied Alexander during his journey to the Oracle in the Siwa Oasis where he was proclaimed a son of Zeus. Ptolemy had his first independent command during the campaign against the rebel Bessus whom Ptolemy captured and handed over to Alexander for execution. When Alexander died in 323 BC, Ptolemy is said to have instigated the settlement of the empire made at Babylon. Through the Partition of Babylon, he was appointed satrap of Egypt, under the nominal kings Philip III Arrhidaeus and the infant Alexander IV; the former satrap, the Greek Cleomenes, stayed on as his deputy. Ptolemy quickly moved, without authorization, to subjugate Cyrenaica. By custom, kings in Macedonia asserted their right to the throne by burying their predecessor. Probably because he wanted to pre-empt Perdiccas, the imperial regent, from staking his claim in this way, Ptolemy took great pains in acquiring the body of Alexander the Great. On his deathbed, Alexander the Great wished to be buried at the Temple of Zeus Ammon in the Siwa Oasis of ancient Libya instead of the royal tombs of Aigai in Macedon. However, his successors including Perdiccas attempted to bury his body in Macedon instead. In late 322 or early 321 BC, the body of Alexander the Great was in Syria, on its way to Macedon, when it was captured by Ptolemy I Soter. He brought Alexander's remains back to Egypt, interring them at Memphis, but they were later moved to Alexandria where a tomb of Alexander the Great was constructed for them. Shortly after this event, Ptolemy openly joined the coalition against Perdiccas. Perdiccas appears to have suspected Ptolemy of aiming for the throne himself, and may have decided that Ptolemy was his most dangerous rival. Ptolemy executed Cleomenes for spying on behalf of Perdiccas; this removed the chief check on his authority, and allowed Ptolemy to obtain the huge sum that Cleomenes had accumulated. In 321 BC, Perdiccas attempted to invade Egypt, only to fall at the hands of his own men. Ptolemy's decision to defend the Nile against Perdiccas ended in fiasco for Perdiccas, with the loss of 2,000 men. This failure was a fatal blow to Perdiccas' reputation, and he was murdered in his tent by two of his subordinates. Ptolemy immediately crossed the Nile, to provide supplies to what had the day before been an enemy army. Ptolemy was offered the regency in place of Perdiccas; but he declined. Ptolemy was consistent in his policy of securing a power base, while never succumbing to the temptation of risking all to succeed Alexander. In the long wars that followed between the different Diadochi, Ptolemy's first goal was to hold Egypt securely, and his second was to secure control in the outlying areas: Cyrenaica and Cyprus, as well as Syria, including the province of Judea. His first occupation of Syria was in 318, and he established at the same time a protectorate over the petty kings of Cyprus. When Antigonus One-Eye, master of Asia in 315, showed expansionist ambitions, Ptolemy joined the coalition against him, and on the outbreak of war, evacuated Syria. In Cyprus, he fought the partisans of Antigonus, and re-conquered the island (313). A revolt in Cyrene was crushed the same year. In 312, Ptolemy and Seleucus, the fugitive satrap of Babylonia, both invaded Syria, and defeated Demetrius Poliorcetes ("besieger of cities"), the son of Antigonus, in the Battle of Gaza. Again he occupied Syria, and again—after only a few months, when Demetrius had won a battle over his general, and Antigonus entered Syria in force—he evacuated it. In 311, a peace was concluded between the combatants. Soon after this, the surviving 13-year-old king, Alexander IV, was murdered in Macedonia on the orders of Cassander, leaving the satrap of Egypt absolutely his own master. The peace did not last long, and in 309 Ptolemy personally commanded a fleet that detached the coastal towns of Lycia and Caria from Antigonus, then crossed into Greece, where he took possession of Corinth, Sicyon and Megara (308 BC). In 306, a great fleet under Demetrius attacked Cyprus, and Ptolemy's brother Menelaus was defeated and captured in another decisive Battle of Salamis. Ptolemy's complete loss of Cyprus followed. The satraps Antigonus and Demetrius now each assumed the title of king; Ptolemy, as well as Cassander, Lysimachus and Seleucus I Nicator, responded by doing the same. In the winter of 306 BC, Antigonus tried to follow up his victory in Cyprus by invading Egypt; but Ptolemy was strongest there, and successfully held the frontier against him. Ptolemy led no further overseas expeditions against Antigonus. However, he did send great assistance to Rhodes when it was besieged by Demetrius (305/304). The Rhodians granted divine honors to Ptolemy as a result of the lifting of the siege. When the coalition against Antigonus was renewed in 302, Ptolemy joined it, and invaded Syria a third time, while Antigonus was engaged with Lysimachus in Asia Minor. On hearing a report that Antigonus had won a decisive victory there, he once again evacuated Syria. But when the news came that Antigonus had been defeated and slain by Lysimachus and Seleucus at the Battle of Ipsus in 301, he occupied Syria a fourth time. The other members of the coalition had assigned all Syria to Seleucus, after what they regarded as Ptolemy's desertion, and for the next hundred years, the question of the ownership of southern Syria (i.e., Judea) produced recurring warfare between the Seleucid and Ptolemaic dynasties. Henceforth, Ptolemy seems to have involved himself as little as possible in the rivalries between Asia Minor and Greece; he lost what he held in Greece, but reconquered Cyprus in 295/294. Cyrene, after a series of rebellions, was finally subjugated in about 300 and placed under his stepson Magas. In 285, Ptolemy made his son by Berenice – Ptolemy II Philadelphus – his co-regent. His eldest legitimate son Ptolemy Keraunos, whose mother Eurydice had been repudiated, fled to the court of Lysimachus. Ptolemy I died in January 282 aged 84 or 85. Shrewd and cautious, he had a compact and well-ordered realm to show at the end of forty years of war. His reputation for good nature and liberality attached the floating soldier-class of Macedonians and other Greeks to his service, and was not insignificant; nor did he wholly neglect conciliation of the natives. He was a ready patron of letters, founding the Great Library of Alexandria. Eirene, who was given in marriage to Eunostos of Soloi in Cyprus. During the Susa weddings, Ptolemy married Persian noblewoman Artakama, as ordered by Alexander the Great. Ptolemy Keraunos, king of Macedon from 281 BC to 279 BC. Meleager, who ruled as King of Macedon during 279 BC for two months. A third son, whose name is unknown but who is referred to as 'rebel in Cyprus', who was put to death by Ptolemy II Philadelphus. Lysandra, first married to Alexander V of Macedon and after to Lysimachus' son Agathocles. Arsinoe II, who married first Lysimachus, then her half-brother Ptolemy Keraunos and finally her full brother Ptolemy II. Later Ptolemaic pharaohs based their appearances on coins off of that of Ptolemy I, as shown by these coins of (left to right) Ptolemy VI, Ptolemy VIII, Ptolemy IX, and Ptolemy XII. Ptolemy I was the founder of the Ptolemaic dynasty. Among its members was Cleopatra VII, the last pharaoh to rule Egypt prior to Roman control. Ptolemy himself wrote an eyewitness history of Alexander's campaigns (now lost). In the second century AD, Ptolemy's history was used by Arrian of Nicomedia as one of his two main primary sources (alongside the history of Aristobulus of Cassandreia) for his own extant Anabasis of Alexander, and hence large parts of Ptolemy's history can be assumed to survive in paraphrase or précis in Arrian's work. Arrian cites Ptolemy by name on only a few occasions, but it is likely that large stretches of Arrian's Anabasis reflect Ptolemy's version of events. Arrian once names Ptolemy as the author "whom I chiefly follow", and in his Preface claims that Ptolemy seemed to him to be a particularly trustworthy source, "not only because he was present with Alexander on campaign, but also because he was himself a king, and hence lying would be more dishonourable for him than for anyone else". Ptolemy's lost history was long considered an objective work, distinguished by its straightforward honesty and sobriety, but more recent work has called this assessment into question. R. M. Errington argued that Ptolemy's history was characterised by persistent bias and self-aggrandisement, and by systematic blackening of the reputation of Perdiccas, one of Ptolemy's chief dynastic rivals after Alexander's death. For example, Arrian's account of the fall of Thebes in 335 BC (Anabasis 1.8.1–1.8.8, a rare section of narrative explicitly attributed to Ptolemy by Arrian) shows several significant variations from the parallel account preserved in Diodorus Siculus (17.11–12), most notably in attributing a distinctly unheroic role in proceedings to Perdiccas. More recently, J. Roisman has argued that the case for Ptolemy's blackening of Perdiccas and others has been much exaggerated. Ptolemy personally sponsored the great mathematician Euclid. He found Euclid's seminal work, the Elements, too difficult to study, so he asked if there were an easier way to master it. According to Proclus Euclid famously quipped: "Sire, there is no Royal Road to geometry." ^ Hölbl, Günther (2013). A History of the Ptolemaic Empire. Routledge. p. 21. ISBN 9781135119836. ^ Jones, Prudence J. (2006). Cleopatra: A Sourcebook. Norman: University of Oklahoma Press. p. 14. ISBN 9780806137414. They were members of the Ptolemaic dynasty of Macedonian Greeks, who ruled Egypt after the death of its conqueror, Alexander the Great. ^ Pomeroy, Sarah B. (1990). Women in Hellenistic Egypt. Detroit: Wayne State University Press. p. 16. ISBN 9780814322307. while Ptolemaic Egypt was a monarchy with a Greek ruling class. ^ Redford, Donald B., ed. (2000). The Oxford Encyclopedia of Ancient Egypt. Oxford University Press. ISBN 9780195102345. Cleopatra VII was born to Ptolemy XII Auletes (80–57 BCE, ruled 55–51 BCE) and Cleopatra, both parents being Macedonian Greeks. ^ Bard, Kathryn A., ed. (1999). Encyclopedia of the Archaeology of Ancient Egypt. New York: Routledge. p. 488. ISBN 9781134665259. Ptolemaic kings were still crowned at Memphis and the city was popularly regarded as the Egyptian rival to Alexandria, founded by the Macedonian Greeks. ^ Carney, Elizabeth (2010). Philip II and Alexander The Great: Father and Son, Lives and Afterlives. New York: Oxford University Press. ISBN 978-0-19-973815-1. ^ a b c d e Chisholm 1911, p. 616. ^ Grimal, Nicolas (1992). A History of Ancient Egypt. Oxford: Blackwell Books. p. 382. ISBN 978-0-631-19396-8. ^ Arrian (1976). de Sélincourt, Aubrey (ed.). Anabasis Alexandri (The Campaigns of Alexander). Harmondsworth: Penguin Books. III, 30. ISBN 978-0-14-044253-3. ^ Lauren O'Connor (2008). "The Remains of Alexander the Great: The God, The King, The Symbol". Constructing the Past. Retrieved 28 March 2019. .
^ Green, Peter (1990). Alexander to Actium. University of California Press. pp 13–14. ISBN 9780520083493. ^ Anson, Edward M (Summer 1986). "Diodorus and the Date of Triparadeisus". The American Journal of Philology (The Johns Hopkins University Press) 107 (2): 208–217. doi:10.2307/294603. JSTOR 294603. ^ a b c d Chisholm 1911, p. 617. ^ a b c d Ogden, Daniel (1999). Polygamy Prostitutes and Death. The Hellenistic Dynasties. London: Gerald Duckworth & Co. Ltd. p. 150. ISBN 07156 29301. ^ a b Clayman, Dee L. (2014). Berenice II and the Golden Age of Ptolemaic Egypt. Oxford University Press. p. 65. ISBN 9780195370881. ^ a b Macurdy, Grace Harriet (1985). Hellenistic Queens (Reprint of 1932 ed.). Chicago: Ares Publishers. ISBN 978-0-89005-542-7. ^ Hölbl, Gūnther (2001). A History of the Ptolemaic Empire. Routledge. pp. 35–36. ISBN 978-0-06-019439-0. ^ McKechnie, Paul; Guillaume, Philippe (16 October 2008). Ptolemy II Philadelphus and his World. Brill. p. 43. ISBN 978-9047424208. ^ Jacoby, Felix (1926). Die Fragmente der griechischen Historiker, Teil 2, Zeitgeschichte. – B. Spezialgeschichten, Autobiographien und Memoiren, Zeittafeln [Nr. 106-261]. Berlin: Weidmann. pp. 752–769, no. 138, "Ptolemaios Lagu". OCLC 769308142. ^ Bosworth, A. B. (1988). From Arrian to Alexander: Studies in Historical Interpretation. Oxford: Oxford University Press. pp. 13–14. ISBN 978-0198148630. ^ Errington, R. M. (1969-01-01). "Bias in Ptolemy's History of Alexander". The Classical Quarterly. 19 (2): 233–242. JSTOR 637545. ^ Roisman, Joseph (1984-01-01). "Ptolemy and His Rivals in His History of Alexander". The Classical Quarterly. 34 (2): 373–385. JSTOR 638295. ^ Robinson, Victor (2005). The Story of Medicine. Whitefish, Montana: Kessinger Publishing. p. 80. ISBN 978-1-4191-5431-7. This article incorporates text from a publication now in the public domain: Chisholm, Hugh, ed. (1911). "Ptolemies" . Encyclopædia Britannica. 22 (11th ed.). Cambridge University Press. pp. 616–618. Walter M. Ellis: Ptolemy of Egypt, London 1993. Christian A. Caroli: Ptolemaios I. Soter – Herrscher zweier Kulturen, Konstanz 2007. Waterfield, Robin (2011). Dividing the Spoils – The War for Alexander the Great's Empire (hardback). New York: Oxford University Press. pp. 273 pages. ISBN 978-0-19-957392-9. Wikimedia Commons has media related to Ptolemy I. This page was last edited on 13 April 2019, at 13:01 (UTC).